Quirky yet classic, contemporary and timeless, Abode Aroma® is an utterly unique interior fragrance collection to delight the senses. A modern, fashion-forward range of beautifully scented and stunningly packaged aromatic diffusers, candles and soaps, Abode Aroma® adds personality and warmth to any home. Abode Aroma® aromatic diffusers are a simple, stylish and effective way to add gentle fragrance and ambiance to any interior space, from bedroom to bathroom, laundry to living room. Subtle, long-lasting fragrance is continuously distributed into the surrounding air via the natural absorption and capillary action of porous reed stems placed in fragranced oil. A softly scented, gently flickering candle adds a further touch of romance and decadence to your surroundings, while lathering up with scented suds completes the indulgent Abode Aroma® experience. The Abode Aroma® Totem collection includes a dazzling array of diverse fragrances, ranging from juicy Blood Orange, to refreshing Sea Mist, earthy Amber, classic Gardenia Bud, and spicy Ginger Pear. For an olfactory overload that will thrill the senses, layer your fragrances by combining a diffuser and candle in the same, or complementary, scent. Made with a high concentration of natural essences, Abode Aroma® aromatic diffusers, candles and soaps are the perfect gift or personal indulgence. Stylishly packaged in fun, colour-rich canisters and boxes, Abode Aroma® products make gift wrapping a thing of the past. 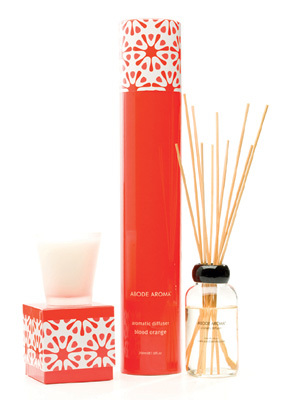 Abode Aroma® Totem aromatic diffusers, candles and soaps are available through selected gift and lifestyle stores. A whisper rather than a shout, Abode Aroma® aromatic diffusers deliver an unobtrusive, yet long-lasting fragrance to enhance your home. Whether you're seeking relaxation or romance, clarity or comfort, Abode Aroma® has a scent to make your senses sing. Abode Aroma® aromatic diffusers create a beautiful ambiance within the home or office by distributing constant, subtle fragrance throughout the room. With a superior formulation of 90% fragrance oil and NO water, Abode Aroma® aromatic diffusers have outstanding fragrance impact and longevity. Porous fibre reeds placed in fragrant oil absorb and disperse the liquid via natural capillary action and gentle fragrance is circulated with the room's airflow. Fragrance strength is controlled by the frequency with which the reeds are turned, with no lighting necessary. Abode Aroma® aromatic diffusers make a sleek and simple decorative statement in any room and provide months of pleasure for the user. While a diffuser creates a stunning ambiance, there is no denying the romantic atmosphere conjured by the soft glow and gorgeous scent of a gently flickering candle. Available in a mouth watering wardrobe of scents, Abode Aroma® hand-poured aromatic candles are rich in natural essences, with a generous burn time of up to 35 hours. Abode Aroma® aromatic candles are beautiful alone, and even more stunning when enjoyed as a companion to our diffusers. Layer a diffuser and candle in the same, or harmonious, scents for an out-of-this-world olfactory experience. We all love to unwind after a long, hard day with a steaming hot shower or leisurely soak in the tub. For true indulgence, lather up with the smooth, scented suds of Abode Aroma's aromatic soap bars. Hand pressed, triple milled and enriched with natural essences, Abode Aroma® aromatic soap bars are the ultimate everyday luxury. Free from animal testing, Abode Aroma® soap bars contain Glycerin to soothe and soften the skin, while your favourite fragrance lifts the spirit.